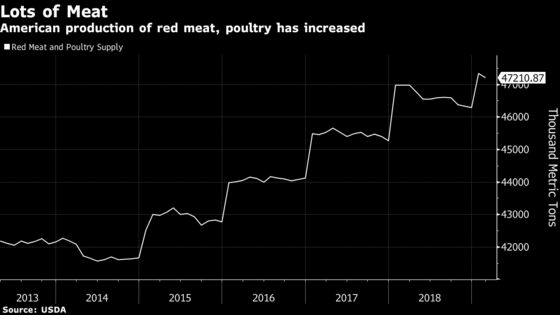 (Bloomberg) -- Cargill Inc. Chief Executive Officer Dave MacLennan’s bet on a rising appetite for protein is helping the agribusiness giant return to profit growth even as global trade disruptions mount. On Thursday, America’s biggest closely held company posted an increase in earnings for the first time since its fiscal quarter ended May 31, 2018. While President Donald Trump’s trade war with China and a disease sweeping through the Chinese hog herd squeeze soybean margins, demand for beef remains strong and salmon feed sales are rising. Efforts to contain costs and spending also helped shield a decline in company-wide sales for the quarter. Cargill is the “C” of the vaunted, “ABCD’s” of agriculture, along with Archer-Daniels-Midland Co., Bunge Ltd. and Louis Dreyfus Co. Its founder William Wallace Cargill pioneered the modern agricultural trading industry when he founded the company in 1865. The company’s overhauled its business, following a rare quarterly loss in 2015. MacLennan has deepened Cargill’s focus on protein, making it less reliant on trading. “Disruptions and uncertainty in the global business environment continued to present challenges during the quarter, but our teams captured greater efficiencies across the company,” the Minneapolis-based firm’s CEO said in a statement. Controlling costs and diversification are becoming even more important for the ABCD’s as global disruptions mount. Washington’s trade war with China has placed U.S.-grown farm products, like soybeans, in the crosshairs of the ruckus. Meanwhile, African swine fever in China has led to lower demand for soybean meal that’s used for feed. Separably, Vale SA’s mine disaster in Brazil impacted the company’s industrial and financial services unit, which houses its metals trading unit and ocean transportation operation.